BEIJING - When the weather turns cold, blood supplies in hospitals can dry up as donors stay home. Guo Mingyi is hoping to change that. The 51-year-old from Northeast China's Liaoning province has donated 60,000 milliliters of blood over the past two decades - equal to the total blood volume of 10 adults. Now he is trying to round up more people to join him. "In Anshan, my home city, my friends and I organized some 700 volunteers who donate blood on a rotating basis. Each time we have 100 people donate together. The donation is enough for up to three or four months of blood supply," he said. Guo, who works at China's second-largest steel maker, Anshan Iron and Steel Group, started to seek volunteer donors for the city's blood station after his first donation in 1990, which was then an assignment from his employer. 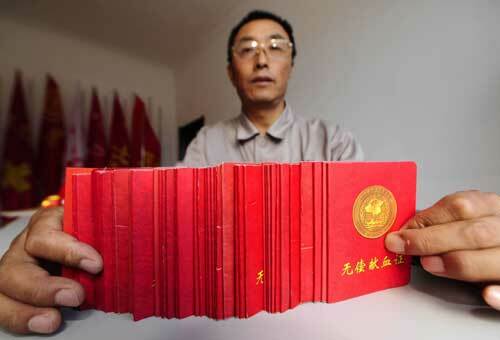 Since then, Guo has donated 54 times, which is enough to save the lives of 75 people. He has also founded two blood-donation clubs in the city with a total of 800 members and persuaded another 1,700 people to donate their life-saving hematopoietic stem cells (HSC) to people with blood cancer. Over the years, he has become one of the most convincing ambassadors for voluntary blood donation in China. On Oct 11, Guo arrived in Beijing, where a local blood station had reported a shortage on Tuesday. His arrival had an immediate effect. "An enterprise owner came to me and said 500 of his employees wanted to donate their blood," Guo said. Guo said this has happened before. "In my earlier trip to Haicheng in Liaoning province, 600 people donated their blood to the Red Cross Society on the spot," said the steel worker with a humble smile. "I believe that there are many who want to donate their blood, only that they are not well-organized." Besides Beijing reporting a blood shortage, the Red Cross Society in Taiyuan, Shanxi province, rang its alarm bells on Sept 12 claiming that the blood reserve in hospitals would only last two to three days because its major donors - college students - had not returned after the summer vacation. Similar emergencies were reported in cities like Hohhot in the Inner Mongolia autonomous region, Nanjing of Jiangsu province, Kunming in Yunan province and Wuhan, Hubei province. Apart from college students, other donors usually show less willingness to give when they are wearing more clothes in the chilly autumn and cold winter. So hospitals always run short of blood between September and October, he said. "There are people who still want to do something for others, they just don't find a way. So we should find a way to get them together, either inside the Party, or by an individual like me or by the government," said Guo, who has been donating his blood cells every two months since 2005. He also visits his workmates in different working groups of the company to ask them whether they want to donate. When he gets a number of people saying yes, he calls the local Red Cross Society to come to the company and collect the blood. In 2006, Guo heard one of his workmate's daughters was diagnosed with blood cancer. To help the child, Guo sent out a message to persuade others to test if their blood matched the girl's. "If the blood matches, you will donate 200 to 400 ml of your blood to the cancer patient, and your HSC will help produce more cells inside her body, which means the two of you will have exactly the same blood," Guo said. "Isn't it amazing?" He was finally able to get 400 workmates to take the test. One was a match and saved the 13-year-old girl. Now the group has expanded four times and is still growing. In respect to Guo's warm heart, many called him a "modern-day Lei Feng", a symbol of altruism held high by Chairman Mao in the 1960s. Lei also worked at the steel plant before he died in 1962 in a truck accident. "I did not do this to get famous," Guo said. "It's just that some people need some help, and there should be someone standing out to give them a hand. "If you help them, they will think like, wow, why would a stranger help me? They will think, and offer their helping hands to others in need. How do you like a life like that?"